An elegant blonde in off-white straight skirt, coat and black pumps sings, “I like order … straight margins, brief conversations.” She is Ivonne, head secretary of the steno pool, and we feel we know her – her primness, her insistence on order, her unwavering devotion to distance and form. She stands before the audience, as if it were a mirror in the company bathroom, and she instructs on the neatest, most efficient way to apply lipstick: Cherries in the Snow, Revlon’s finest: “the dot on the i” of feminine propriety. Soprano Marnie Breckenridge unerringly sings the eponymous Ivonne in the short opera by composer Nathaniel Stookey, with libretto by Jerre Dye, that was a highlight in West Edge Opera’s Snapshots this past weekend in Berkeley and San Francisco. Marnie Breckenridge singing “Ivonne” (music by Nathaniel Stookey, libretto by Jerre Dye) at West Edge Opera’s “Snapshots”. Photo by Mark Drury. In this sung monologue, three short scenes spell out the banality and the tragedy of Ivonne’s cloistered worklife. Set to music for violin, viola and piano, the incisive and witty libretto leads Ivonne from the sanctuary of the bathroom mirror where she composes her face to the petty rigidity of the steno pool (“Sea of Aquanet”) and back to the “perfect Godly quiet” of the powder room where one of the secretaries has a miscarriage, and Ivonne must pick up the tiny ruined fetus in her Winter White coat before returning to the mirror to redo her face. Her lipstick applied in three precise, but forever changed, strokes. Stookey’s music, like the libretto, was spare but emotionally to the point. Beginning with a melancholic lyricism in the strings and ending with interrupted phrases, syncopated and dissonant, pitting moments of silence against the soprano’s running monologue. Developed by Brian Rosen and West Edge Opera, Snapshots is one of West Edge Opera’s innovative and wonderful, in all ways, opera programs. In collaboration with Earplay, one of the Bay Area’s finest new music ensembles, Snapshots presents excerpts from new operas by established and emerging West Coast composers in chamber concert settings. This year’s venues were the Odd Fellows Lodge in Berkeley and the Wilsey Opera Center’s Taube Atrium Theater in San Francisco. Along with the Stookey/Dye opera, Snapshots presented excerpts from The Road to Xibalba with music by Cindy Cox and libretto by John Campion, Medicus Mortem by composer Beth Ratay and librettist Andrew Rechnitz, and Zheng, music by Shinji Eshima and words by Tony Asaro. Music Directors Jonathan Khuner of West Edge Opera and Mary Chun of Earplay precisely led eight instrumentalists from the Earplay ensemble. Cindy Cox’s The Road to Xibalba provided the widest range of instrumentation and experimentation, perhaps only to be expected for a mythological setting and story. Xibalba is the Mayan underworld, and the libretto by John Campion told the story of the Hero Twins who defeat the Demon Lords in the Popol Vuh. The composer used electronic sampling as well as field recordings, additional percussion and bird whistles. With short phrases of sound, trills, plucked bass strings and the violin bow ricocheting across the strings, the music was like the sounds that rise and fall in nature, seemingly spontaneous and surprising. Each sound moved away into silence at the same time as others appeared and disappeared, giving an overall precariousness to the music, which was both delicate and pleasing. 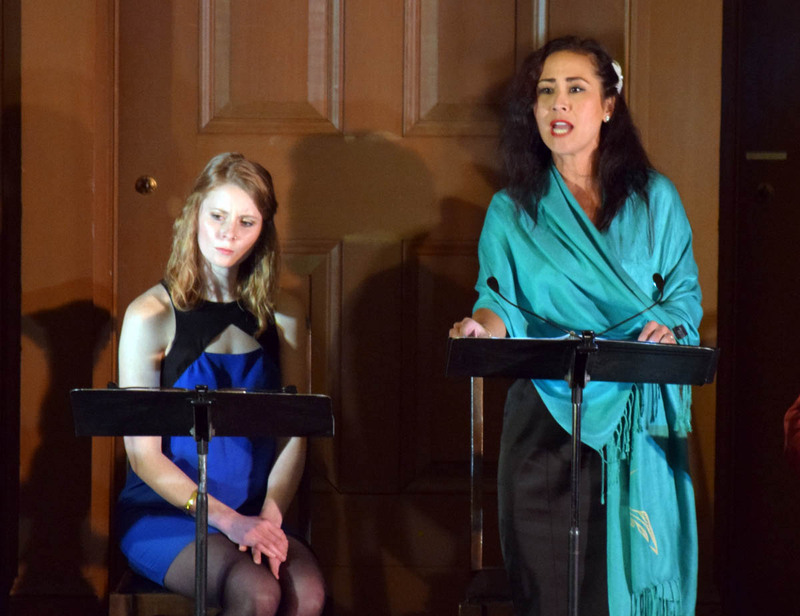 Amy Foote (seated) and Nicole Takesono sing “The Road to Xibalba” by composer Cindy Cox and librettist John Campion. Photo by Mark Drury. Much of the libretto was spoken rather than sung, maintaining a distinction between storytelling and expressed emotion. Soprano Amy Foote sang Little Blood, the bird who births the Twin Heroes, and tenor J. Raymond Meyers made a charming owl, flying arms outstretched. Baritones Daniel Cilli and William Weidner were the Demon Lords. Nicole Takesono sang the grandmother. The other opera excerpts dealt with the somber theme of death. Beth Ratay’s Medicus Mortem tells of a doctor accused of killing his terminally ill daughter. J. Raymond Meyers sang the role of the accusing lawyer Mephisto; the strings furiously upholding his denunciation. And baritone Daniel Cilli sang the role of Doctor Death. During the duet with his daughter, sung by Julia Hathaway, the piano marked out time, like the beating of a heart. Shinji Eshima’s Zheng was about the opera singer, mezzo Zheng Cao, who died of lung cancer in 2013, at the age of 46. Mezzo Nicole Takesono sang the role of Zheng in this touching tribute to the singer.